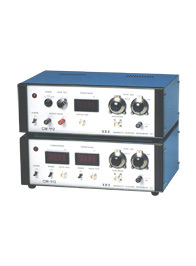 Precisely measures the capacitance value of various substances. Optimum for detecting various substances and for controlling quality. Using the measured capacitance of a substance based on its dielectric constant (a basic constant of insulated substances) we can check for the presence, changes, contents, and characteristics of powders and mixed liquids precisely. It can be used for quality control and the detection of substances as well as measuring water content and displacement.We can also provide sensors with tailored shapes and designs, according to the customer’s needs. Can measure dielectric constants very easily. It can measure capacitance precisely, and is not affected by the dielectric. A one-end ground type electrode is used so it is easy to use in the field. The cable between the electrode and the main housing can be extended up to 5m without affecting the measurement results. A 4/20mA output signal allows control of local equipment. A variety of electrodes are available, so the best-matching electrode can be chosen. Special electrodes can be designed and manufactured on request. Its unique compensation circuit allows the meter to make small manual zero point corrections caused by changes in temperature. Although this meter is highly sensitive, it is designed to ignore electrical noise and inductive noise, making it highly reliable in factory environments. Measures minute displacements, low moisture levels, film thickness, and changes in the character of resins and ceramics. Measures and displays both capacitance and conductance, independently. As the mutual interference between the capacitance and inductance is small, the meter can measure the dielectric constant of conductive substances. Measures moisture content and density, as well as levels of adhesive materials.